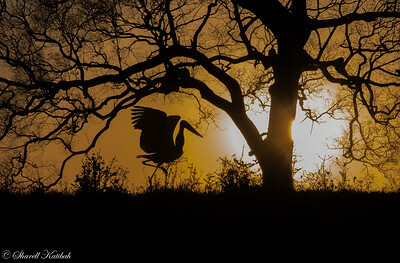 In the summer of 2016 we traveled to the Pantanal of Brazil with our friend and photographic guru Roy Toft. 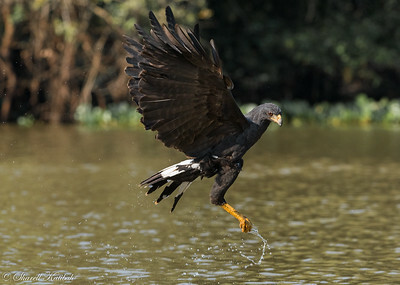 The Pantanal is located in southwestern Brazil, bordering Bolivia and Paraguay. 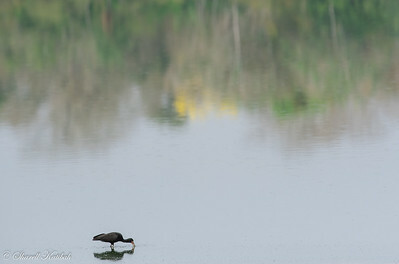 It is the world's largest seasonal wetlands. It floods each summer (Dec-March), and the waters recede during the winter months of June, July and August. The vast collection of wildlife--birds, reptiles, mammals--concentrate where the water remains. 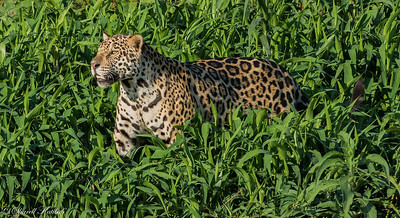 The primary attraction for photographers is the jaguar, but there are endless interesting and unique species to observe, photograph, and enjoy. 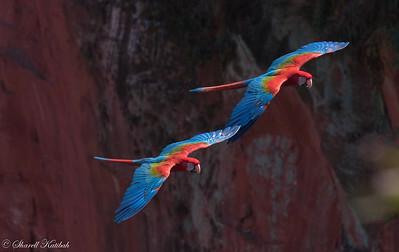 The various species of birds, especially, draw birders and photographers from around the world. The Pantanal is generally divided into North (in the Mato Grosso) and South(Mato Grosso Do Sul); the dividing line is the Rio Piquiri. 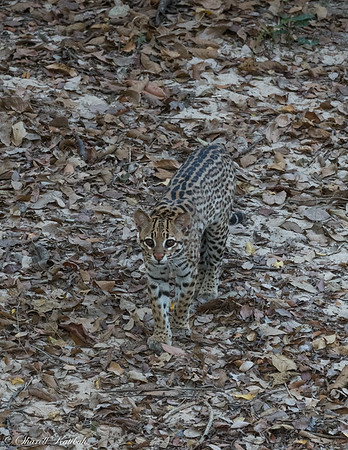 We spent 5 nights in the north, 5 nights on the Rio Piquiri at the "Jaguar Flotel", and another week at various locations in Mato Grosso Do Sul. Most of the time we were staying on Fazendas, or cattle ranches. These cattle ranches, many of which have existed for over 200 years, are an indisputable part of the Pantanal landscape and ecosystems. 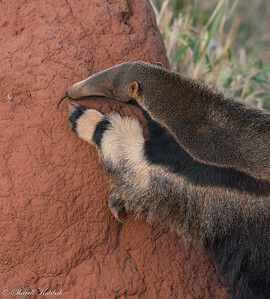 Many of the ranches are beginning to commit themselves to research and preservation of the unique and fragile ecosystem of the Pantanal. Ecotourism is beginning to take hold as a number of ranchers understand their unique role is preserving this incredible ecosystem. 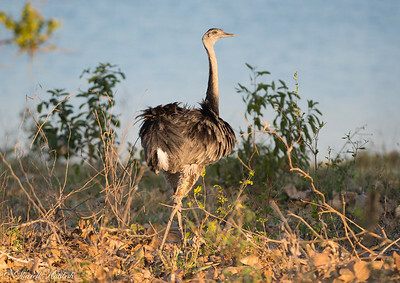 We spent each day photographing animals, either traveling in boats or land vehicles. We had incredible guides who seemed to find wildlife at every turn. Our group of photographers was one of the most congenial groups I have ever had the pleasure of traveling with. We had so much fun together and formed an incredible bond. Spending time with this outstanding level of photographer has helped me to up my game in ways I could barely dream of. I felt that my skills increased daily--and I had a great time as well! It was a magical 3 weeks in a magical place. 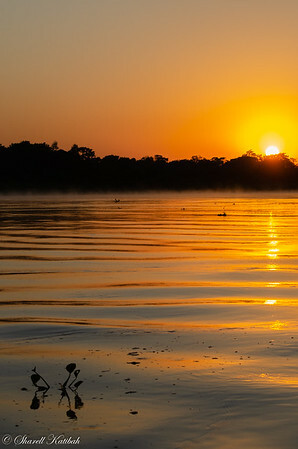 The better part of our days in the North Pantanal was spent on boats on the rivers looking for wildlife to observe and photograph. We were on the rivers before dawn for the morning rides. After a siesta we would head back out again and return near dark. The days were very full, exciting, and fun. 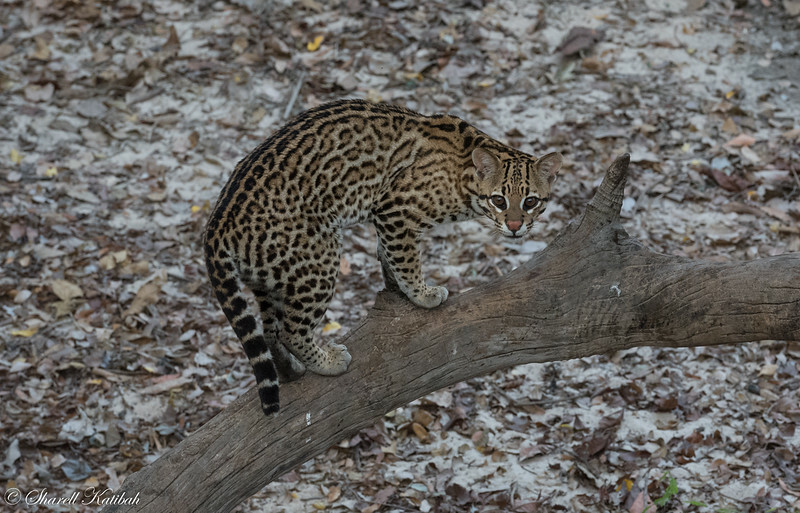 We observed the ocelots for two consecutive nights. They were absolutely beautiful. Marley put on quite a show lounging along the riverbank. He was our most photographed jaguar by far. 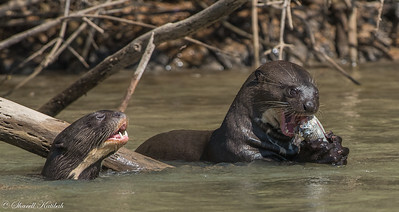 River otter eat about 5 kg of fish a day, so they are constantly hunting. The smaller otter was chirping loudly at us while the other one had his meal. We weren't sure if he was agitated by us or begging for part of the meal. 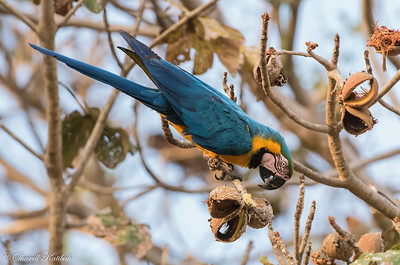 These macaws were seldom seen during our trip, and when they were they were generally in trees eating the seeds from these pods. This was the sought-after animal for the last part of our trip to Jardim/Bonito. One of the photographers spotted him from the bus within a very short time. We spent a long time photographing and nearly missed lunch (which the Brazilians serve and eat very close to noon each day). It didn't matter to us--he was a beauty! 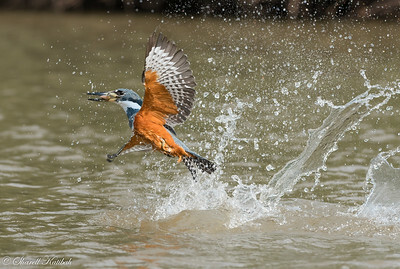 This is one of many kingfishers who dove to retrieve fish that our guides threw into the river at Southwild. It was quite the challenge to get sharp photos of them in action. This is one of my favorites. The mother is Ruth; her two cubs are about 9 months old. She called them out of their safe spot in the brush and then swam with them along the river to a new hiding place. Jaguars are one of the few cats with a natural affinity for water. 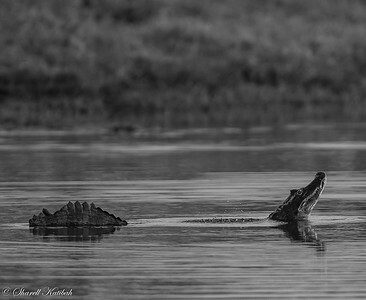 They are good swimmers, a much needed skill for survival in the Pantanal. 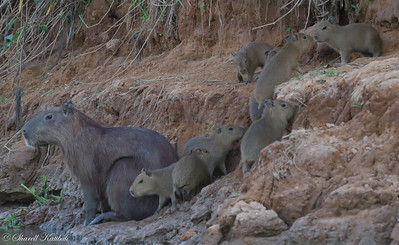 The capybara live in large groups and have lots of babies. The babies will nurse from any lactating female, not just their mother. It is not uncommon to see 8 nursing babies at any time. 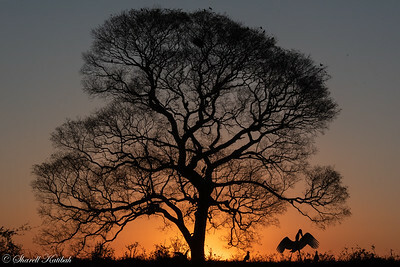 At Southwild the jabiru hang out at this beautiful tree at sunset in hopes of receiving some fish from onlookers. Roy coached us on the settings for a beautiful silhouette, our guide Marcos tossed the fish, and we all got some of the most beautiful photos of the trip. 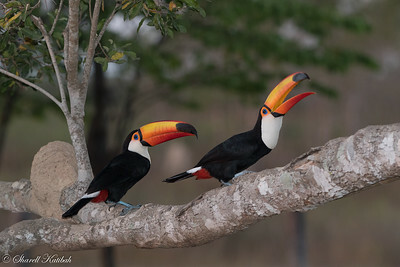 These toucans are the largest in the world! 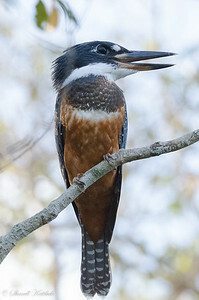 They had just returned to Southwild after a number of months away, and they put on quite a show for us first thing in the morning. 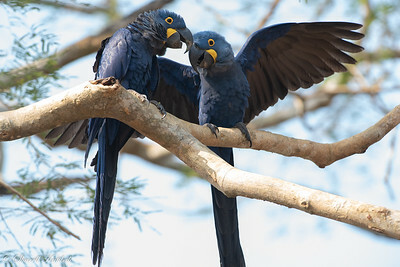 We spent hours and hours at Fazenda Barranco Alto listening to and watching hyacinth macaws. We almost always heard them squwaking before seeing them. They put on an amazing show. 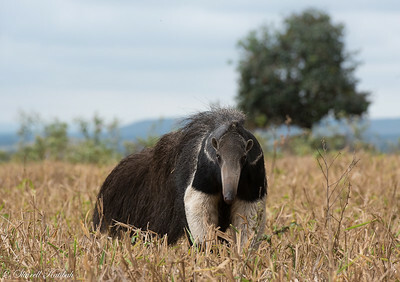 We photographed this anteater in absolutely beautiful light at the end of day. We were downwind and managed to get very close. It was incredible to be able to get close enough to see tongue and claws. 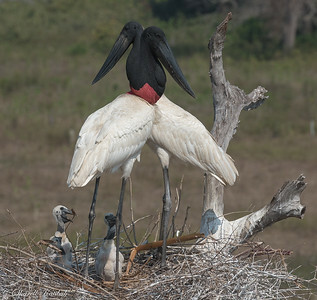 These Jabiru storks are permanent residents at Southwild. Directly across from their nest at the top of a tall tree is a viewing tower which guests can climb to observe and photograph the storks. The parents took turns on the nest, each leaving for a time to get food for their chicks. The days were warm but the mornings were cool with mist on the river. Going out on the river before the sun came up was otherworldly. 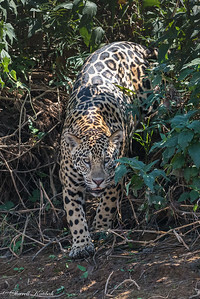 It is always such a gift to watch the world come to life each day, especially when there is the possiblity of seeing jaguars! Marley--again--showing how beautiful he is. I wondered if this adult female was just looking for a moment of peace by the river. If so, she certainly wasn't getting it! This image is one of the most challenging of the trip for me. 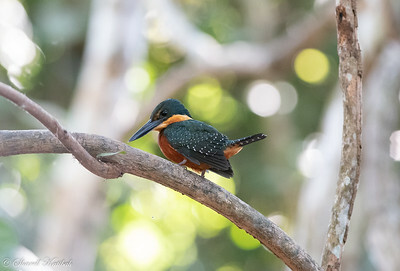 These kingfishers are quite tiny and tend to hang out deep in the foliage along the shore. We were in a boat right underneath him and I was twisted nearly upside-down in a very unnatural position holding a very large lens. Mission accomplished!! Male caiman will perform this mating ritual on chilly misty mornings. They elevate their head and tail in the water and move the scales on their back to create bubble. The caiman with the biggest bubbles gets the girl. We were fortunate enough to watch this pair over a long period of time. Their eggs will be laid and chicks hatched after about 6 weeks. 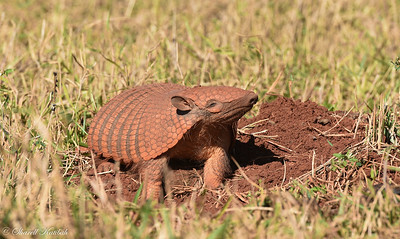 Another strange animal of the Pantanal. The rust color of the animal comes from the color of the dirt. 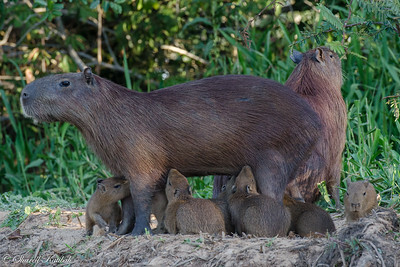 Capybara, the world's largest rodents, are native to South America. 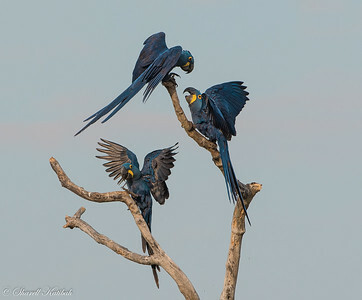 They are ubiquitous in the Pantanal as they generally live in and near water. At the Southwild Ecolodge they even sleep on the lawn at night. It is not unusual to find them on your doorstep in the wee hours of the morning. I laughed out loud at this line of them as seen from the jabiru viewing tower. Who knew that rodents followed the leader? 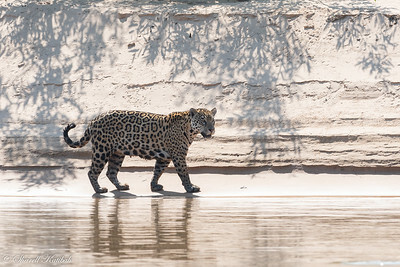 We had 7 jaguar sightings on our second day along the Rio Piquiri. Marley, a two-year old male, was the most photogenic. 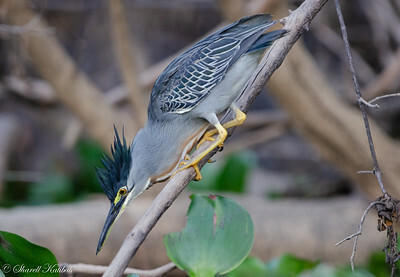 He emerged from the bushes and stalked a caiman in the river. The attempt was not successful but fascinating to watch. 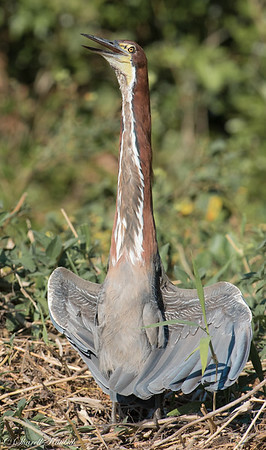 I thought that the heron's neck extension was most impressive. Apparently this is a cooling technique during the heat of the day. 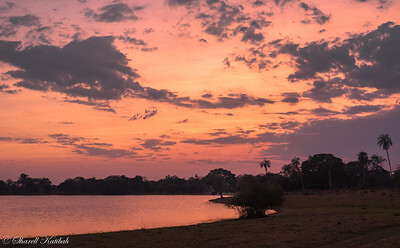 The sunrises and sunsets in the Pantanal are short, intense, and some of the most beautiful that I have ever seen. 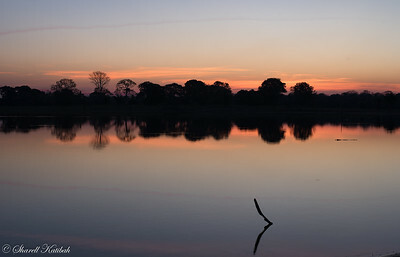 Cattle ranching is part of the landscape of the Pantanal. Ranches have been here for 250 years, a result of European settlement in Brazil. 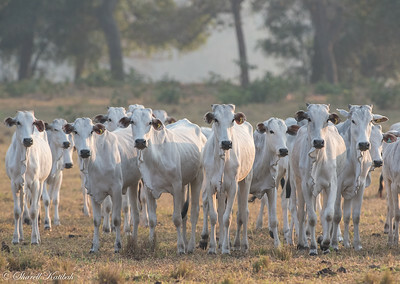 The White Brahma cow thrives in the environment of the Pantanal. 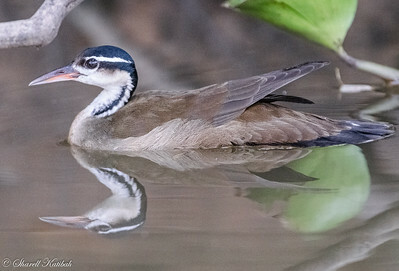 I was captivated by the beautiful colors of this bird and by its odd and interesting bill (perfect for shoevling food from the shallow bottoms of waterways). 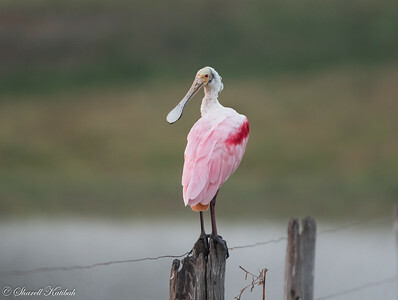 Another "bird on a stick", but what a lovely bird indeed! 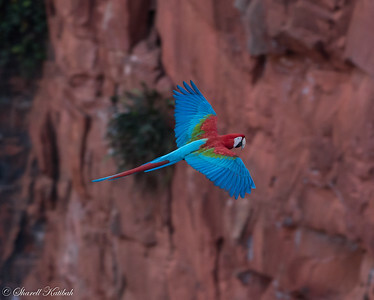 The most challenging photography of our trip was photographing these beautiful macaws at a natural sinkhole where they collect to feed and roost at night. It was a long hard day which yielded some beautiful photos--eventually! Southwild has some photography blinds set up in an area where ocelots live. They are usually very shy and secretive cats, but they will come out to feed when some bait (small pieces of chicken) is put out for them. We had an opportunity to observe and photograph these beautiful cats. Check out the size of their paws! Patricia is a nursing mother, but her cubs were well hidden and never seen by us. 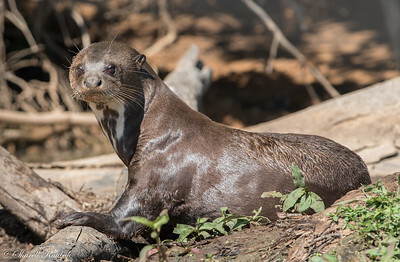 Giant river otter are commonly seen in the riverways of the Pantanal. 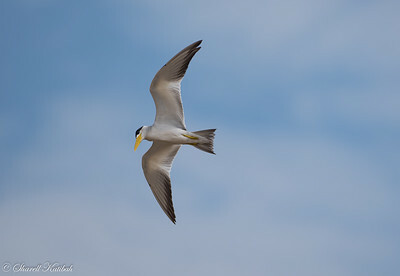 They live in groups, are quite social, and are voracious hunters. 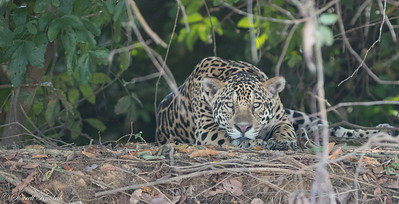 As a rule they are not bothered by jaguar since they are equally as ferocious and could inflict some serious damage if provoked. 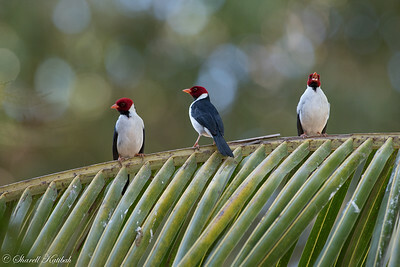 These birds are common visitors to feeders thoughout the Pantanal. They are quite pretty with a sweet song. 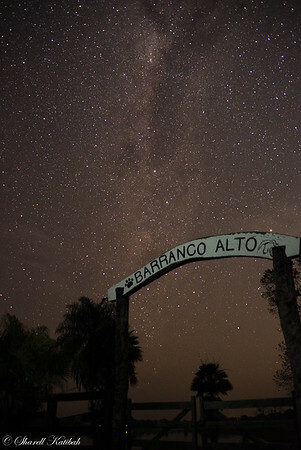 The night sky at the fazendas was unreal--so clear and bright. The Milky Way looked thick and creamy--it really did earn its name! I loved the reflections of the trees in the water above the ibis. It was such a beautiful scene. Such an absolutely beautiful bird.